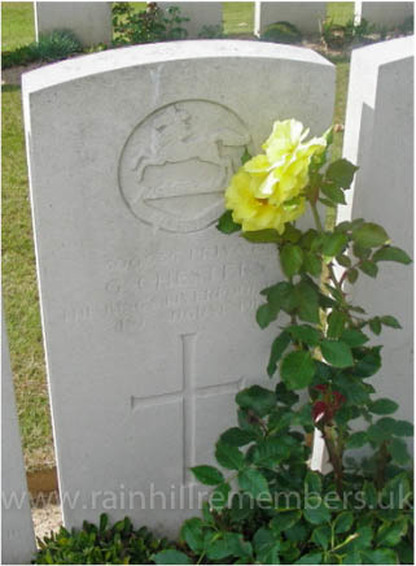 George Chesters was born in 1882 in Farnworth, Widnes. He spent his childhood in Whitchurch, Shropshire, but by 1911 he was living as a boarder at 351, Walkers Lane, St Helens with John and Mary Lowe and their two sons. He was 28 and his occupation was that of a groom. His parents were George and Hannah, still living at Bradeley near Whitchurch. He enlisted at Knowsley Park into the Lancashire Hussars Yeomanry, 1/1st as Trooper 996. In July 1917, the Regiment was dismounted and sent for infantry training. It was then absorbed into the 18th Service Battalion of the King’s Liverpool Regiment on 24th September 1917. He became Private 500535. He was killed in action on 31st August 1918 aged 36 and buried at H.A.C. Cemetery, Ecoust – St Mien in grave 1.C.32. In this cemetery, rows B.C. and D. came about between August and September 1918 when the area was recaptured by the 3rd Division after 5 months of enemy occupation. The Commonwealth War Grave Commission grave stone commemorating the death of George Chesters in H.A.C. Cemetery Ecoust - St. Mien.